Mee Suah Soup is one of my favourite noodle soup. 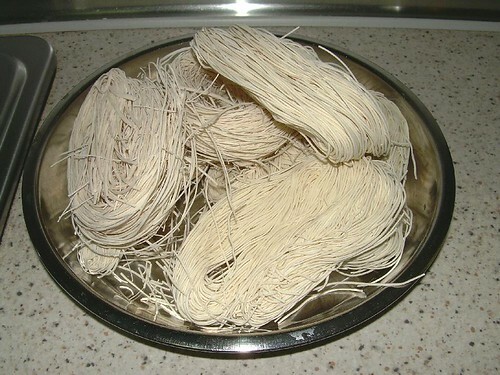 Mee Suah, which is usually sold in dried form, is made from rice flour and is very brittle in uncooked form as the strands are really thin. This dish is more or less an automatic dish for breakfast on the first day of Chinese New Year at my home. It is also eaten to celebrate the chinese birth days at home. 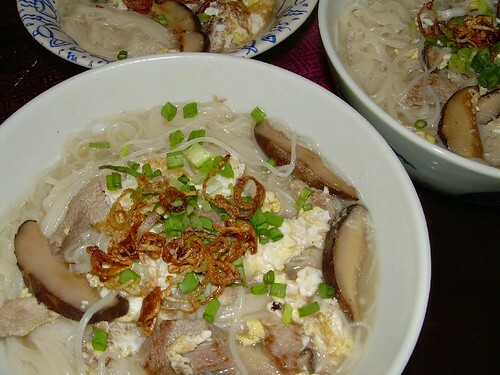 Mee Suah is also cooked in different ways. There is the famous Red Mee Suah cooked by the people of Foochow dialect and there is also the chicken soup Mee Suah. Our family recipe is quite easy to prepare and cook and if you could get your hands on the ingredients, give it a try. Oh, by the way, generally there are two types of mee suah (or at least, in Malaysia). One is the factory pre-packed mee suah manufactured in Muar, Johor whilst the other is made by the Foochow community – usually from Sibu and Sitiawan. The former is thicker and bland tasting on its own whilst the latter is fine and thin (and smoother) but saltish in flavour. If you are using the former, you will need to add seasoning (eg. salt to taste) but for the latter, no seasoning is needed. My recipe here uses the latter. Heat oil in wok and fry shallots till golden brown. Remove fried shallots. Leaving about 2 tablespoons of oil in wok, add mushrooms and saute for 30 seconds to 1 minute. Push to the side of the wok. Add pork and stir fry till changed colour. Push to the side of the wok. Add remaining oil into wok and fry the eggs. Try not to break the eggs too much. Return mushrooms and pork into the fried egg and stir well for another 15 seconds or so. Add water and bring to boil. Add mee suah and stir well. Mee suah cooks fairly quickly and should turn colour when done. Garnish with fried shallots and spring onions prior to serving. Serves approximately 3 to 4 bowls here. but red mee suah,never try before. Learnt something new from you again – there are 2 types of mee suah. Noted. mspretty : The red mee suah recipe is a Foochow speciality. The soup is red in colour! babe_kl : Yeah…not only is it fine, it is pretty strong and does not break easily when cooked. Mee sua…mee sua….my mum will cook this during birthday of any family member and the whole family will enjoy a bowl of simmering mee sua with pork balls(ba yee), hard-boiled eggs, and sometimes pigs kidney(yo chi)…. tigerfish : Ya, ya, sometimes we have hard-boiled eggs in substitution of the “fried egg” in this recipe. Just omit the fried egg bit and “garnish” with one hard-boiled egg per serving (or two for the birthday boy 🙂 ). We also add pig’s kidney and liver. Yummylicious! I don’t like Mee Suah lei… I find them too soft. simcooks : Wait till you see the next recipe 😉 Hint! Hint! Ohhh… mee suah! I love birthday mee suah soup served with pork, chinese mushroom, pork liver and kidney and hard boiled egg– and the birthday person will have 2 eggs while other family members only have 1 egg. Being here in US it’s very hard to find good pork liver and kidney, so I only serve mee suah with pork, mushroom and eggs on birthdays– a birthday tradition I want to keep and pass on to my children. i’m Muarian… of course i suka mee suah… sedapp! Think it’ll turn out okay if I were to cook the mee sua in a separate pot? good recipe, as I only eat it with red wine. Will try with mushroom soup. thanks.